I’m in Festival City, a waterfront resort in Dubai. Queen is about to perform with Paul Rodgers and I have to pinch myself to believe that they are here. Admittedly, I could be at a gig where the band has a little more spring than strain in its onstage antics—Fergie of The Black Eyed Peas is singing only 30km away—but in the new must-see, must-do Dubai, I think I came up trumps in the ticket stakes. “Not long ago, Dubai’s culturescape was beyond barren," says Esperanca de Souza, a lifelong resident of the city and a self-confessed culture vulture. “Now, the events calendar virtually heaves with festivals, celebrating everything from cinema and jazz to art and literature." It’s a dream come true for Padma Coram, co-founder of Talent Brokers, one of the first entertainment companies to invite international acts to Dubai. “In 1996, when I wanted to host one of London’s most venerable dance brands here, I was told, ‘We’ve heard of a ministry of education or a ministry of defence, but what is Ministry of Sound?’ The UAE today is a completely different country," she says. In less than 10 years, Dubai has welcomed every kind of celebrity from Justin Timberlake to the Russian ballet and Anish Kapoor to Oliver Stone. “When I came to Dubai in the 1990s, everyone wanted to hang out in shopping malls," says Didier Brun, the newly appointed CEO of Khaleej Times. “The fact that we have a weekly TimeOut is a sign that Dubai has come a long way." Located strategically between the East and West, Dubai is now living up to its reputation as the most liberal of the Islamic city-states and boasts of a packed calendar this winter. “With close to 30,000 attendees last year, our jazz fest is truly one of the most popular in the Middle-East," says Anthony Younes, managing director for Chillout Productions, organizers of the Skywards International Dubai Jazz Festival. 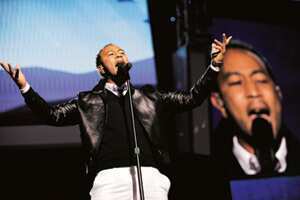 In its seventh year, the fest is all about kicking back on grassy knolls, nestling in beanbags and indulging in improv and fusion performances by the likes of Dee Dee Bridgewater, Jamie Cullum or, in 2009, James Blunt and John Legend. Dubai’s rock culture is also on the up. The much-anticipated Desert Rock Festival in March is as much about heavy metal mosh-masters playing to rock-starved crowds as it is about kooky sideshows. “There’s a lot of metalheads in the Middle-East and they all come flocking to Dubai," says Mathilde Montel of Centre Stage Management. “We’ve grown from a 3-hour concert to a two-day festival." In the past, Dubai Desert Rock has seen Velvet Revolver, Muse and Korn sandblast the airspace and the organizers have gone further to develop an urban music festival and a back-to-school festival, simply to meet growing demand. In terms of art, too, Dubai has gone for broke. “A few years ago, there was a single museum and a handful of serious art galleries," says Tarane Ali Khan of Third Line Art Gallery. “Today, I wouldn’t be surprised if there’s a hundred!" Third Line and others have initiated a focus on West Asian, South Asian and African painting, photography, sculpture and installation art. Christie’s and Bonhams, renowned British art auctioneers, have moved in sharpish. “People in this part of the world are certainly not neophytes when it comes to art," says Matthew Girling, chief executive for Bonhams Europe and Middle East. “There’s a great willingness by the government and the people of this city to participate in the world art market. They’re very sophisticated." Without a doubt, the showstealer is Art Dubai, a three-day fair showcasing works from at least 30 countries and, in particular, heavyweight galleries such as the White Cube, Continua and Chemould Prescott Road. Held at the Madinat Jumeirah resort, the fair exhibits works by legendary and upcoming artists across spacious rooms, a canal and over Arabian wind towers. “The fact is that there was a degree of seriousness and a commitment towards contemporary art in the UAE," says John Martin, one of Art Dubai’s co-founders. “An art scene is not something you can buy or import into a city because then it has no character. It has to be built by the people who live here." Dubai continues to be synonymous with glitz, glamour and petro and real estate dollars but its international festivals have scaled considerable heights in a relatively short time. “Glamour and film festivals go hand-in-hand but we’re making a concerted effort to grow films as not just entertainment but as an art form too," says Majid Wasi of the Dubai International Film Festival. The 5th Dubai International Film Festival will screen at least 180 films from 65-odd countries and will no doubt attract the usual pack of Hollywood heart-throbs and onscreen legends. “I remember, when we first brought Elton John here," reminisces Coram. “No one recognized him at the Gold Souk and he was so thankful to be able to shop in peace." *Dubai International Film Fest: Till 18 December. Visit www.dubaifilmfest.com for schedules and tickets. At Emirates Palace Auditorium, Abu Dhabi. At Dubai Media City. Visit www.dubaijazzfest.com for tickets. At Dubai Mall. Visit www.desertrockfestival.com for details. At Madinat Arena. Visit www.artdubai.ae for details. At Al Jahili Fort and Emirates Palace Auditorium. Unless otherwise mentioned, visit http://www.itp.net/tickets/ for tickets and full schedule.